A week after a shooter slaughtered 17 people in a Florida high school, thousands of protesters, including many angry teenagers, swarmed into the state Capitol on Wednesday, calling for changes to gun laws, a ban on assault-type weapons and improved care for the mentally ill. The normally staid Florida Statehouse filled with students, among them more than 100 survivors of the Feb. 14 attack at Marjory Stoneman Douglas High School in Parkland, on the edge of the Everglades. They held signs, chanted slogans and burst into lawmakers' offices demanding to be heard. The teens were welcomed into the gun-friendly halls of power, but the students' top goal — a ban on assault-style rifles such as the weapon used in the massacre — was taken off the table a day earlier, although more limited measures are still possible. Many protesters complained that lawmakers were not serious about reform, and they said they would oppose in future elections any legislator who accepts campaign contributions from the National Rifle Association. She added: "We've had enough of thoughts and prayers. If you supported us, you would have made a change long ago. So this is to every lawmaker out there: No longer can you take money from the NRA. We are coming after you. We are coming after every single one of you, demanding that you take action." Outside the building, the crowd burst into chants of "Vote them out!" as speakers called for the removal of Republican lawmakers who refuse to address gun control issues. One sign read, "Remember the men who value the NRA over children's lives" and then listed Republicans in Florida's congressional delegation. Other signs said, "Kill the NRA, not our kids" and "These kids are braver than the GOP." About 30 people left an anti-gun rally outside Florida's Old Capitol and began a sit-in protest at the office of four House Republican leaders, demanding a conversation about gun legislation. "They're not speaking to us right now. We only asked for five minutes and so we're just sitting until they speak," Tyrah Williams, a 15-year-old sophomore at Leon High School, which is within walking distance of the Capitol. In Washington, students and parents delivered emotional appeals to President Donald Trump to act on school safety and guns. The president promised to be "very strong on background checks," adding that "we're going to do plenty of other things." And at a news conference Wednesday, Broward County, Florida, Sheriff Scott Israel ordered all deputies who qualify to begin carrying rifles on school grounds. The rifles will be locked in patrol cars when not in use until the agency secures gun lockers and lockers, he said. "We need to be able to defeat any threat that comes into campus," Israel said. The sheriff said the school superintendent fully supported his decision. Stoneman Douglas' school resource office was carrying a weapon when the shooting happened last week, but did not discharge his firearm. It's unclear what role he played in the shooting. The sheriff said those details are still being investigated. At a town hall held by CNN in Sunrise, Florida, on Wednesday night, thousands of angry students, teachers and parents booed Republican Sen. Marco Rubio when he indicated that he would not support an assault-weapons ban and applauded Dem. Rep. Bill Nelson when he pushed Rubio to work on a bill that they both could support. They also booed a spokeswoman from the NRA when she said the answer was not to ban weapons but to ensure they stay out of the hands of the mentally ill.
Also Wednesday, teens in at least a dozen South Florida schools walked out of class to protest gun violence and commemorate the shooting victims. 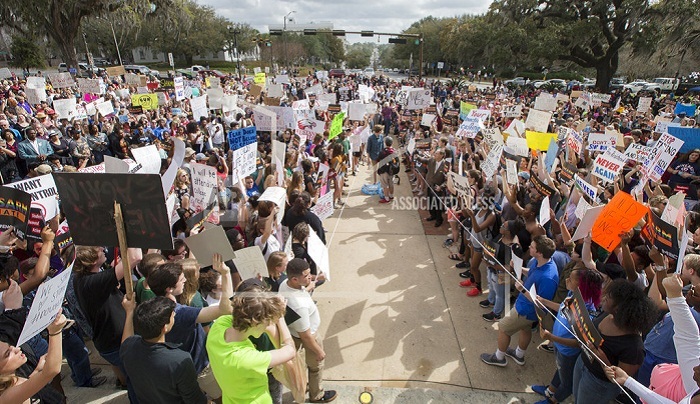 About 2,000 students, parents, teachers and supporters held hands and chanted outside the Parkland campus. Megan Mui, a 15-year-old, walked 2 ½ hours from her school to Stoneman Douglas. "I want to show my support for the changes we need to make so this never happens again," she said, adding that she would like to see a ban on weapons like the AR-15. "They should be strictly for military" purposes. The suspect, 19-year-old Nikolas Cruz, has been jailed on 17 counts of murder. Defense attorneys, state records and people who knew him indicate that he displayed behavioral troubles for years, including getting kicked out of the Parkland school. He owned a collection of weapons. When another lawmaker said he supported raising the age to buy assault-style weapons to 21 from 18, the students broke into applause. Florida lawmakers have rebuffed gun restrictions since Republicans took control of both the governor's office and the Legislature in 1999. Saying the tragedy at the high school was "completely unavoidable," Republican legislative leaders say they will consider legislation that will likely call for raising the age limit to purchase a rifle in Florida and increasing funding for mental health programs and school-resource officers, the police assigned to specific schools. Lawmakers are also considering a program promoted by one Florida sheriff that calls for deputizing someone to carry a weapon on campus. Legislators may also enact a waiting period for rifle purchases. "I am extremely, extremely angry and sad," 16-year-old student Alfonso Calderon said at a news conference at the Statehouse after meeting with lawmakers. "I don't know if I will have faith in my state and local government anymore." He added, "People are losing their lives and it's still not being taken seriously."